Last Year, LEGO announced that they will be producing a Tron: Legacy Light Cycle! The set, which came to life via their LEGO Ideas fan creation site, is almost ready for release. The design has undergone some great changes, and fans will get two Light Cycles and three Minifigs; Sam Flynn, Quorra and Rinzler. The Tron: Legacy LEGO Set includes 230 pieces. The set is priced at $34.99. According to a tweet from LEGO, this will be available March 31st. Though it’s unclear if that means release date or pre-order date. Check out the product page Here. Build, play and display with this futuristic LEGO® Ideas 21314 TRON: Legacy set from Disney, featuring 2 Light Cycles, each with minifigure seats and translucent-colored light-style elements, plus a divisible TRON grid with attachment points for the vehicles. Use the grid as a display base for the Light Cycles or split it in 2 to recreate the chase scene from Disney’s TRON: Legacy movie. Alternatively, stage an Identity Disc battle between the 3 included LEGO minifigures—Sam Flynn, Quorra and Rinzler—on the grid. This construction toy includes a booklet with information about its fan creator and LEGO designers, plus the lowdown on Disney’s TRON: Legacy movie and its main characters. Includes 3 LEGO® minifigures: Sam Flynn, Quorra and Rinzler. Features 2 buildable Light Cycles for Sam Flynn and Rinzler, and a TRON grid/display base. Sam Flynn’s Light Cycle features a minifigure seat, authentic features and assorted translucent-blue light-style elements, including power stream effects. 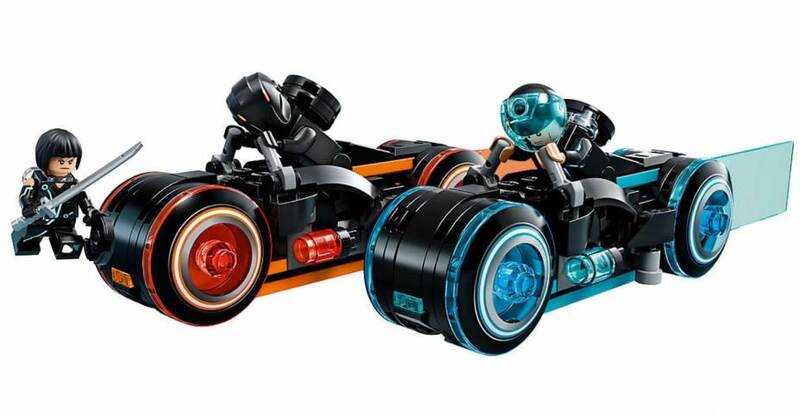 Rinzler’s Light Cycle features a minifigure seat, authentic features and assorted translucent-orange light-style elements, including power stream effects. TRON grid/display base features 2 detachable parts, attachment points for the 2 Light Cycles and translucent-blue elements. Divide the grid to recreate the Light Cycle chase scene from Disney’s TRON: Legacy movie, or use it to role-play the disc battle scene with the minifigures. Accessory elements include Sam Flynn and Quorra’s blue Identity Discs, and Rinzler’s 2 orange Identity Discs. Attach the discs to the back of each minifigure. This construction toy includes a booklet with building instructions, information about the set’s fan creator and LEGO designers, and the lowdown on Disney’s TRON: Legacy movie and its main characters. Each Light Cycle measures over 1″ (5cm) high, 6” (17cm) long and 1” (4cm) wide. TRON grid/display base measures over 8” (22cm) wide and 3” (9cm) deep.